Staplers are a necessity for any office or home. Advanced Document Systems Solution Inc. offers a wide variety of staplers including electric staplers, flat staplers, office staplers and extra heavy capacity staplers to assist you with any type of project. Electric staplers will help you complete larger projects with accuracy, speed, and precision. Traditional staplers are adequate for smaller jobs but for handling hundreds and thousands of documents, an electric stapler is very beneficial. The time and money saved in higher productivity and faster turn around times on your stapling projects will more than outweigh the initial investment in an electric stapler. Electric staplers and heavy capacity staplers also ensure accuracy, eliminating the vagaries of human error and fatigue. In addition, workplace injuries to the hands and wrists are avoided as electric staplers are easy to load, quiet and easy to use. With a single touch, the user can assure their project is completed with accuracy, precision, and ease. Please consult the comparison table to review the features of each stapler we carry, including paper widths and formats. 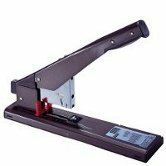 Advanced Document Systems & Supply features the 5080 Electric Stapler, a unique electric stapler that can automatically staple up to 80 sheets of 20 lb paper. It uses a flat-clinch mechanism, easy-loading staple cassettes, and a protective shield that shuts off the machine when open. It is quiet and easy to load and maintain. Browse our catalog of electric staplers and heavy capacity staplers, as well as ordinary desktop flat staplers and office staplers, to find the capacity and performance you require to get the job done. Browse our catalog of additional paper handling products and supplies including Paper Joggers, paper drills, money handling machines and more! Contact our knowledgeable staff today for the widest selection, lowest prices and unsurpassed service on all types of binding machines, laminating machines, and supplies: 800.808.2377. The W117L Heavy Duty Stapler can staple up to 150 sheets at a time. 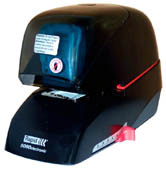 This heavy duty paper stapler comes with a sturdy design and fully adjustable 10" throat depth. The Staplex Model SU-100N Ultra Heavy Capacity Electric Stapler makes heavy-duty table-top binding affordable to everyone! 500% faster than any other way to staple or bind! Saves time, money and effort! Staples up to 215 sheets. Adjustable paper stop with English and metric rulers. A unique electric stapler that can automatically staple up to 80 sheets.